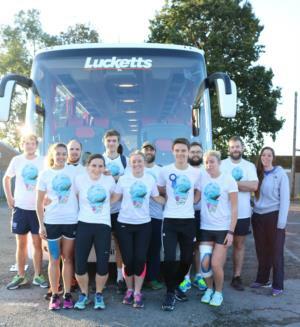 Charity runners made it to the start line of this year’s Great South Run with a little help from local coach firm, Lucketts Travel. The Fareham company donated a coach to transport people from Havant Rugby Club to the event, which attracted 20,000 runners on Sunday (October 22). It meant the 24-strong team of runners from the rugby club could relax on the way to the run and prepare themselves for the 10-mile challenge. The stress-free start paid off, with all 24 completing the run and raising thousands of pounds for Friends of Ocean Ward charity between them.